• Triggers the child’s drive to explore and challenge gravity using the total body. * The Tumblex is not available at this time. Lightweight and mobile, the Boundex and Tumblex can be used indoors or outside. Before and after use of the Baby Boundex™ for 3.5 months. 4 year old child with CP. 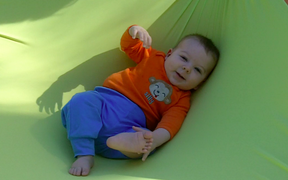 The Baby Boundex™ can be used in a variety of ways with a variety of age groups and diagnoses.